"A bit of old-fashioned common sense and a lot of hard work" - England's leading primary school head teacher's recipe for success. Barbara Jones does not have too much time for government initiatives, adapting them as she and her experienced staff see fit, to suit children's needs. "You don't need all this money spent," she said. Her school, Combe Church of England Primary near Witney in Oxfordshire, is small, with only 115 pupils spread across four classes. "We are not in challenging circumstances," she readily admits. "But as Ofsted pointed out, we are not a 'green wellie brigade' either." The school heads this year's achievement tables. Not only did all the Year 6 pupils reach the level expected for their age in each test subject, it was the only school in which they all reached the next level, expected of 14-year-olds. Out of 13,562 mainstream schools with valid results, 228 others also achieved a maximum aggregate score of 300 - the most that have done so. Combe and three others have scored 300 for all four years shown in the tables. Last year the same four, plus four others, were in that select band. Mrs Jones, who is 63, teaches four days a week alongside her four other full-time teachers, two part-timers and two higher-level learning assistants. "We have a very supportive parent body and very motivated children," she said. "But we all work very hard - the children, the staff and the support staff. It doesn't come easily." She said the school was on a very limited site, with no hall, dining room or library - and no room to expand. "We could fill our school three times over. We turn down people all the time. We can't even take any more children if they move into the village. Mrs Jones also gets on her "high horse" about the new official focus on synthetic phonics as the key to getting children to read. "We do teach phonics," she said. "Both types - and lots of other things as well. "I do wish the powers that be wouldn't just go down one route and think that's the answer - it isn't." Some children would learn to read on their own, while others would struggle even though they were intellectually very able, she said. Her heart sank at the report on Thursday saying the method known as synthetic phonics should take priority. "I thought, 'poor little souls'. "And you are getting parents stressed. They think they are a fool because their child isn't reading fluently by the age of five. The lowest aggregate score this year was 57 (47 last year) - at Sinfin Primary School in Derby. In recent years its score has been 120, 213 and 141. Sinfin's head, Judith Lloyd-Williams, said it served an area of municipal housing and when children arrived most were "well below the average". "Over 50% of pupils are eligible for free school meals, which reflects the unemployment, low income levels and high deprivation in the area." The school had reviewed its practices and intended to improve over the next few years. "Part of that process has already begun as pupils are now in a brand new building, resources have increased with the move to the new school and the learning environment has improved," she said. The school that found itself in that position last year - with a score of 47 - was Canklow Woods in Rotherham. This year it headed the list of year-on-year improvement, rising 146 points to 193. 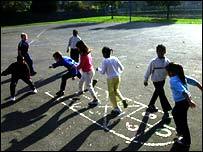 Three of the 10 worst-performing schools in 2005 are in Kent. The lowest value added score, the measure of how children have improved during their time in the school, was 94.9 - at Bushbury Hill primary in Wolverhampton. The highest was 106.0 - at Manor Junior and Infant, in Coseley, Bliston - also in Wolverhampton LEA. The England average was 100.2. The lowest average point score per pupil was 17.3 - at The Furness Primary in Brent, where the aggregate score for all three subjects was 128. As usual the Department for Education and Skills has issued a list of the top 100 or so schools which have shown the most sustained improvement over the past four years. Top of this table was Eastborough Junior Infant and Nursery School in Kirklees, which went from an aggregate score of 85 in 2002 to 247 this year, a rise of 162. 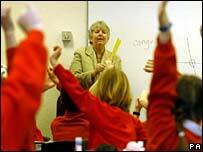 Its head teacher, Nicola Roth, said she would rather the league tables did not exist. "Three years ago we were on the bottom. That was really hurtful," said Nicola Roth. "I would hate for any other school to have to go through that." Two schools had results in one subject annulled by the Qualifications and Curriculum Authority (QCA) for cheating. In another two, an investigation is continuing because they have appealed. So their results - in English, in one case, and maths in the other - are up in the air. This appeal process is new this year - last year one school fiercely protested it had done nothing wrong but the QCA annulled all its results. Part of the school's complaint was that there was, at the time, no appeal mechanism. Among different local education authorities, the one with the highest aggregate score (267) was Richmond upon Thames. Worst was Hackney, on 209. The England average was 240, up three on last year.